March 26, 2014 - Following two recent incidents in which transport category airplanes landed at the wrong airports, the National Transportation Safety Board has issued a Safety Alert to remind pilots of the vigilance required to avoid such potentially catastrophic mistakes. The latest Safety Alert, "Landing at the Wrong Airport," cites the January 2014 incident in which a Southwest Airlines 737 landed at the wrong airport in Branson, Missouri; and the November 2013 incident in which a Boeing 747 cargo plane landed on a 6,100-foot runway instead of the 12,000-foot one at its intended airport 12 miles away. Wrong airport landings present serious safety hazards, including the risk of overrun because a misidentified runway may not be long enough to accommodate the landing airplane, and the risk of collision with other aircraft due to an unexpected incursion into the runway environment. "All of us have experienced a loss of situational awareness at some time, but the consequences for pilots mistaking a nearby airport for the intended one, or landing on the wrong runway or a taxiway, can have catastrophic consequences," said NTSB Chairman Deborah A.P. Hersman, "which is why it's so important to maintain a vigilant approach to following procedures throughout every flight." The Safety Alert outlines five measures pilots can take to avoid a wrong airport landing, and provides additional flight safety resources. What can flight crews do? - Pilots must adhere to standard operating procedures (SOPs), verify the airplane’s position relative to the destination airport, and use available cockpit instrumentation to verify pilots are landing at the correct airport. - Pilot must maintain extra vigilance when identifying the destination airport at night and when landing at an airport with others in close proximity. - Pilots must be familiar with and include in their approach briefing the destination airport’s layout and relationship to other ground features; available lighting such as visual glide slope indicators, approach light systems, and runway lighting; and instrument approaches. - Pilots must use the most precise navigational aids available in conjunction with a visual approach when verifying the destination airport. - Pilots should confirm that they have correctly identified the destination airport before reporting the airport or runway is in sight. On January 12, 2014 a Boeing 737-7H4, Southwest Airlines Flight 4013, landed at the wrong airport in Branson, Missouri, in night visual meteorological conditions (VMC). The airplane was scheduled to fly from Chicago Midway International Airport, Chicago, Illinois, to Branson Airport. Instead, the flight crew mistakenly landed the airplane at M. Graham Clark Downtown Airport, Branson, Missouri. The flight crew reported that they were flying direct to a fix for an area navigation (RNAV) approach. They advised the air traffic controller that they had the airport in sight; they were then cleared for the visual approach. Although the correct destination airport was depicted on their cockpit displays, the flight crew reported flying to the airport that they visually identified as their destination; once the airport was in sight, they did not reference their cockpit displays. The airplane stopped at the end of the 3,738-ft runway after a hard application of the brakes. 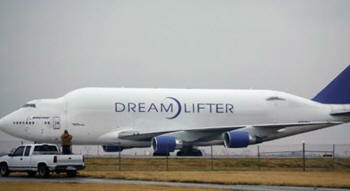 On November 21, 2013, a Boeing 747-400LCF (Dreamlifter) landed at the wrong airport in Wichita, Kansas, in night VMC. The airplane was being operated as a cargo flight from John F. Kennedy International Airport, Jamaica, New York, to McConnell Air Force Base, Wichita, Kansas. Instead, the flight crew mistakenly landed the airplane at Colonel James Jabara Airport, Wichita, Kansas. The flight crew indicated that during their approach to the airport, they saw runway lights that they misidentified as McConnell Air Force Base. The flight was cleared for the RNAV GPS 19L approach, and the flight crew saw Jabara but misidentified it as McConnell. The flight crew then completed the flight by visual reference to the Jabara runway. Once on the ground at Jabara, the flight crew was uncertain of their location until confirmed by the McConnell Air Force Base tower controller. The Jabara runway is 6,101 ft long, whereas McConnell runways are 12,000 ft long.